Located in the village of Kalyves, Villa Margarita Exi enjoys spectacular vistas of Souda Bay below. This 6 bedroom house admires sea views from your very own private heated pool, fabulous upper terrace and a spacious lawn. After a day of unwinding at the villa, why not take a short drive to the resort of Kalyves? Here you can sample the local Greek food at a choice of restaurants and take a walk along the beach. Pool heating, WiFi and air conditioning/heating in the bedrooms and lounge are included. This villa is all about the stunning sea views. Think cool drinks on a choice of terraces watching the sunset - absolute bliss! The large private swimming pool is great for relaxing and admiring the stunning sea and mountain views. For those who want to soak up the sun, there are plenty of sun loungers around the pool and a lawn for some family fun games. There is a covered terrace with a relaxed seating area, plus a brick BBQ where you can dine alfresco in true Greek style. Villa Margarita Exi is accessed by a private entrance with a gate opening onto the off-road parking area. 11 steps lead up to the main entrance of the villa. There is also a walkway from the parking area which leads to the lower ground floor entrance and pool area. The bright, open plan kitchen, diner and seating area on the ground floor is a great place to socialise after a day around the pool. Relax in the living area which is dominated by the fantastic views over the bay and beyond. From here patio doors open to a spacious terrace where you will find a further dining table and chairs - perfect for evenings spent watching the sunset. An external set of stairs lead from this terrace to the pool area below. The kitchen is fully equipped for your holiday meals and has a small breakfast table. On the lower ground floor, there is a small kitchenette and games room equipped with pool table and table tennis - great for some friendly competition! Patio doors open out to the covered terrace and pool area. On the lower ground floor there 2 twin bedrooms sharing a separate bathroom. Upstairs on the ground floor you will find 1 double bedroom and 1 twin bedroom which share a bathroom. Both bedrooms have their own private balconies with amazing sea views. 2 further twin bedrooms on the first floor complete the sleeping arrangements. These rooms both have en suite shower rooms and one has access to a private balcony. The other room has patio doors leading to a shared balcony which can also be accessed from the hallway. This balcony enjoys the stunning sea views and is furnished with comfortable seating - a great place to relax with a drink. All bedrooms have neutral tones with some bright finishing touches. This villa is registered and licenced by EOT Greek licensing association. This number is: 1042K123K2823901. 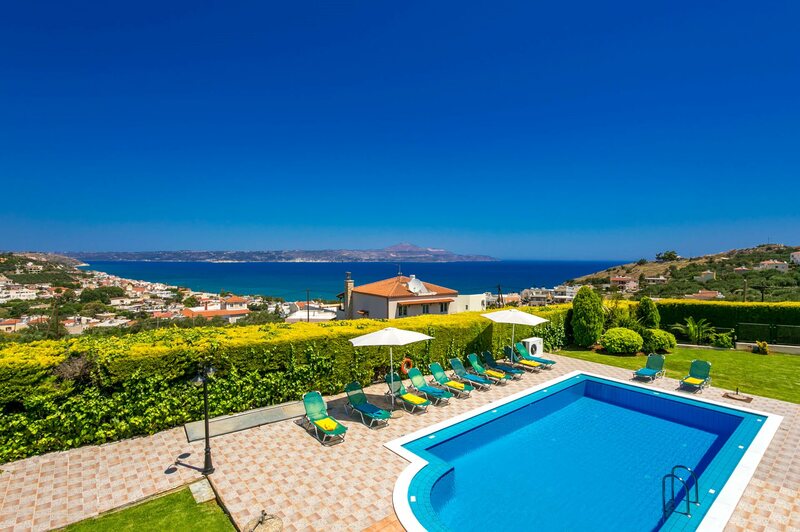 Villa Margarita Exi stands on a hill just outside the seaside village of Kalyves, which has many traditional tavernas, bars, a variety of shops and some lovely sandy beaches. The villa is not far from the small resort of Svoronata on the South Coast of Kefalonia, close to the capital, Argostoli. Unlike most of the island, this area is very flat making it ideal to explore on foot. The livelier resort of Lassi is just a short drive away if you wish to visit its 2 beautiful sandy beaches - Makris Gialos and Platis Gialos. Chania is 20 minutes away by car and is a contrast of old and new, whilst the traditional villages of the White Mountains are on the villas' doorstep. The village of Kalyves has a couple of pharmacies, a bakery, banks, a greengrocer, as well as other shops. A little further afield is the indoor market in Chania, which is an Aladdin's cave for those who like to try local cheeses and olives. The market on Saturday, also in Chania, is the place to head to for the freshest local fruit and vegetables. There are plenty of restaurants and bars to choose from in Kalyves, dotted around the village and along the seafront, all offering warm, Cretan hospitality. The beachside restaurants overlook Kalyves Beach and serve anything from fresh fish and slow cooked lamb to a healthy Greek salad. The traditional resort of Chania has many waterfront restaurants and bars along the harbour. For a taste of the authentic Crete, it's worth experiencing the taveranas hidden within Chania Old Town. Kalyves Beach has golden sands and clear waters that slope gently, making it ideal for families . For a more relaxed swim there's a smaller beach in the village of Kalyves, the other side of the river Xydas. The neighbouring village of Almyrida is full of beauty and is only 5 minutes' drive from the villa. For a day trip to the beach, why not try the fabulous beaches of Falasarna and Balos, in the West of Crete? They are both within an hours' drive, with crystal clear sea, as well as a few tavernas selling fresh fish and local dishes. The neighbouring village of Almyrida has a beautiful beach offering water sports such as snorkelling. Close to Chania is the Golden Fun Park with play activities and 10 pin bowling. The waterpark of Limnoupolis is great for all the family to enjoy and is only a short drive away. Mega Go Karting is on the outskirts of Chania and open 11 hours a day with a children's playground too! Villa Margarita Exi is not available to book for season as it is sold out. Take a look here at the Crete villas that are currently on sale. Horse riding is available Georgioupolis a seaside village resort between Chania and Rethymnon. They offer several different programmes according to ability as well as guided nature walks around the lake of Kournas. This is a very rural area and the White Mountains form a stunning background especially in the spring and early summer when the mountain peaks are snow drenched. The heart of Chania is still the old town, and the hotchpotch of buildings from different eras illustrates the towns complex and turbulent history. The Venetian element is everywhere, from the harbour itself to the Firkas Fortress on the waterfront, which is now a maritime museum. The little streets that zig-zag the old town are full of elegant Venetian buildings, and you can still see the remains of the Venetian walls that once encircled Chania. By way of contrast there is also an ancient Turkish mosque on the waterfront, with Kastelli Hill rising behind it. The mosque is a great landmark, but is no longer used as a religious building, but as an exhibition space. The buildings of the old town are very much alive, and are now shops, restaurants, hotels, artisan workshops and private houses. The new town has grown up all around the old, but the two areas peacefully co-exist. The sandy beach is just a 5 minute walk from the harbour, so the town is very compact and manageable for the visitor. This pristine cemetery is a memorial to British, Australian and New Zealand soldiers and sailors who died during the battles. There are 1,527 graves each marked with a white headstone although sadly many do not have names. This tranquil spot draws many visitors annually who have made long journeys to pay their respects to a family member. Fantastic location and villa - would come again! Sally was our villa rep and she was most helpful .